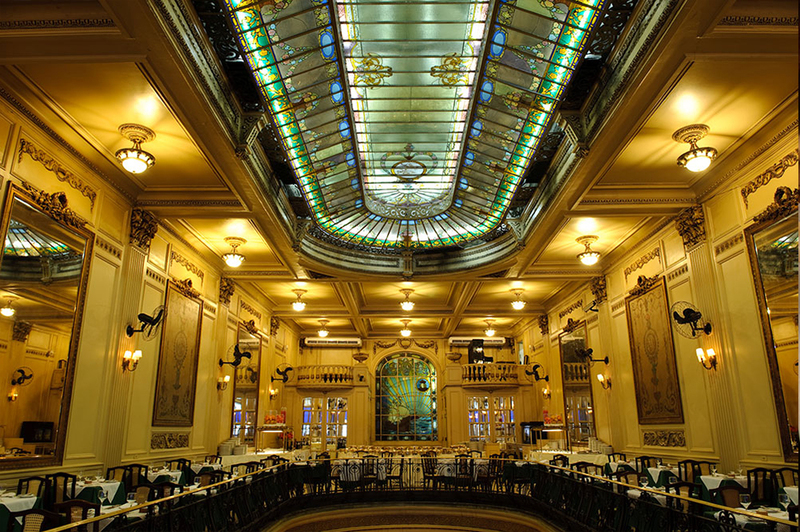 There are of course thousands of restaurants/bars in Rio, and we’ll only be able to cover a few of them here. This is not a tourist blog, but I am sure it will be of interest to those visiting Rio. I’ll divide it up roughly into geographical areas or boroughs, and I’m starting with the downtown area, where there is an eclectic mix of old and new. The first is in one of the oldest streets of Rio, the Rua do Ouvidor, and it is called Antigamente, meaning “The Old Days”. It is certainly in the old historic area of Rio, and looks like the original architecture. It is a typical “botequim” or bar-type restaurant, quite small inside but spilling into the street, which for many years has been pedestrian. For detailed information see http://www.restauranteantigamente.com.br/. “The Girl from Ipanema” is the Bossa Nova song that everyone knows, and it gave its name to the first of a chain of restaurants in Rio, all called Garota. The first was of course Ipanema, where the song was written by Antonio Carlos Jobim and Vinicius de Moraes, in a bar called Bar Veloso, afterwards renamed Garota de Ipanema. With the popularity of the bar/restaurant, the chain had to grow, and now has Garotas in Urca, Copacabana, Flamengo, Gávea,Tijuca and Penha. They are all comfortable, with tables inside and out, and you can have a simple “chope” or a full meal. Personally I like one of their “appetizers”, called Filé Aperitivo or Steak Appetizer, and is a good portion of filet steak served on a hotplate with lots of onions and gravy, and can be accompanied by sliced bread rolls (to soak up the gravy) or potato chips or whatever. You serve the meat as it cooks and as you like it – rare or well-done, and personally I seldom need anything else. For full information on the Garota restaurants click here. Romantic, Asian-themed mansion with gourmet Japanese fish & meat dishes. Established in a spacious corner mansion, its architectural design highlights a local tree that is native to this region. Paying tribute to the name of the restaurant Ki – and in harmony with its spirit, architect Fernando Fernandes structured his work around a tree, which is visible from anywhere in the house. In addition to three covered verandas, it also offers five tatami rooms, two of which are private. The Oriental décor is intimate, with wooden furniture and soft lighting. On its facade, guests are welcomed by another emblematic reference: an eye catching aquarium. For Ki’s Facebook page, click here.